The specifications for standard configuration on your Compaq HP Media Center a1520n system can be found by clicking on the red button above and are also listed in your user manual. This information is for reference so that you know you are purchasing the correct RAM for your Media Center a1520n. 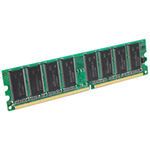 All memory modules found on this page are guaranteed to work in your Compaq HP Media Center a1520n - or your money back. Memory Giant is here to help if you need it - from ordering to installation, we have a qualified support staff ready to help over the phone or online should you have any questions. Memory Comments: PC3200 DDR SDRAM DIMMs. Supports Dual Channel DDR.